Greeks celebrated this as the Day of Artemis Calliste. Artemis was called Diana by the Romans. Calliste was the island created when Euphemus, with Jason and the Argonauts, dropped soil into the sea near Crete. 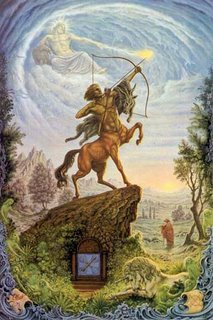 The Sun enters Sagittarius, and the month of the Archer begins. Now that the harvest is gathered and secured, the time of looking farther ahead commences in the drawing of strategic plans. As Sagittarius is ruled by Jupiter, matters of mundane government and law, and also higher laws of metaphysics are emphasized now. The identity and role of Sagittarius hinge on the question of what he has on the point of the arrow he's so obviously aiming at the Scorpion's heart. If it's a poison, then the Archer threatens to kill the Scorpion. But as the Archer is actually the celebrated healer Chiron, placed in the sky by Zeus to honor his wisdom and compassion, the Archer is in fact firing a medicine arrow that can deliver the Scorpion from the sting of its own self-biting energy of excess, sexual flameout, death and transformation. This day is important as a weather marker, as it comes a month before the Winter Solstice, and also gives the farmers one more warning to get the crop in at once. This is why many harvest festivals are celebrated now. Before the change of the calendar, this was the approximate date of Martinmas in England, when servants flocked to hiring fairs to hire themselves out for a new year. It was also called Pack-Rag day, because they carried their possessions with them to their new homes. Since servants got an annual holiday at this time, at which they often returned home to welcoming feasts, it was called Rive-Kite (split stomach) Sunday in Yorkshire. Falling close to the American Thanksgiving, this provides us with another possible source for the American date and customs. As an aspect of Artemis Calliste, the Lily of Heaven, this day, now called St. Cecilia's day, is important to music lovers. In the Roman Catholic calendar, feast of St. Cecilia, patron saint of music. For the Christian community of Rome in the reign of Marcus Aurelius (161 - 180), the beautiful and brilliant Cecilia was a prize of inestimable value. Daughter of the Caecilii, one of Rome's wealthiest and most prestigious patrician clans, Cecilia was among the first, if not the first, Christian convert to come from the upper crust of the ancient nobility. Her connection with music is unclear, though it is known that, with a sure sense of drama and evangelical nerve, Cecilia chose the moment of the prothalamium -- the solemn hymn at the beginning of her wedding ceremony -- to announce to her would-be husband Valerian and a stunned crowd of gowns and togas that she was consecrating her virginity to "a spouse you know not of." She was beheaded after a hot air bath -- a kind of ancient sauna -- that was heated to seven times its normal temperature failed to cook so much as a light sweat out of her miraculously cool body. The Her name derives from a Latin gens (family) Caecilius, whose root word is kaiko, one-eyed, which is the apparent reason why she is a matron of the blind and invoked for protection from eye-disease. Her symbol is the organ, which she is credited with inventing, although that seems unlikely since she died, a martyr in Rome between the years of 161 and 192, supposedly by being suffocated with steam from a hot bath in her own mansion, then beheaded. A church was built on the site, which was near the basilica where Roman women had worshipped Bona Dea Oclata or Restitutrix, who also protected against eye-disease and blindness. She is the patroness of musicians. Barbara Walker believes her myth was inspired by the Muse of Music, Callista, perhaps because she was buried in the cemetery of St. Callistus in Rome. More likely the association comes from a line in the account of her life written in the fifth century which mentions that she sang to God in her heart on her wedding day. Connolly (Oxford Companion to the Year) found some interesting parallels between the legends of the Jewish Esther and the Christian Cecilia. Cecilia's basilica is in a part of Rome with a large Jewish population. St Cecilia's "station day" was the Wednesday after the second Sunday in Lent which is as many days before Good Friday as 13 Adar, the Fast of Esther, is before Passover (on 14 Nisan).